j11, the owner of riot.ru, got BLifePlugin on his smartphone and asked me for a PocketPC version of this plugin for his HTC TyTN. I was too lazy to support a PocketPC configuration of the plugin. Well, my next idea was better and much more useful (I hope). 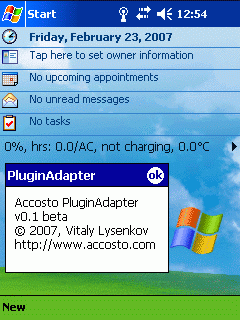 PluginAdapter is a PocketPC Today plugin and can “host” virtually any MS Smartphone homescreen plugin that doesn’t use smartphone-specific features of windows mobile. This XML file is an ordinary smartphone homescreen xml with one restriction: you can have only one <plugin> defined (current version doesn’t support more). You should leave default, scheme, etc. intact because color scheme, fonts, padding and many more are defined there. PluginAdapter doesn’t have its own interface except that one little information box displayed when first Action event occurs (see below). Any smartphone plugin can respond to three keyboard events: joystick left (Left), joystick right (Right) and press joystick (Action). PluginAdapter can convert stylus taps to these events: tap on the left 1/3 of plugin box converts to Left, center 1/3 - Action, right 1/3 - Right event. Plugin will work on touchscreen devices running Windows Mobile 2002 or later (PocketPC or Phone Edition). All tests were passed with PocketPC emulator (Windows Mobile 2003) because I do not have PocketPC. Some guys reported that PluginAdapter works well on Q-Tek S100 (Windows Mobile 2003 SE), HTC TyTN (WM5), Acer n311 (WM5). I used my BLifePlugin as a guest smartphone plugin for all tests (installation package contains both the PluginAdapter and BLifePlugin, version 0.3). Added June 11, 2007: Oh… I’ve forgotten such an important thing. This project is currently in Beta stage, please report bugs and suggestions at this topic at modaco.com. At the download page you may find a debug-logging-enabled version of adapter which can help me to solve problems. Log is saved to \My Documents\PluginAdapter_xx.log. I would be appreciated if your bug reports will be accompanied with log file! Thank you!